Every year around this time, I start gearing up for what has become an annual November tradition for me, a little mini album project called 30 Days of Thankful. 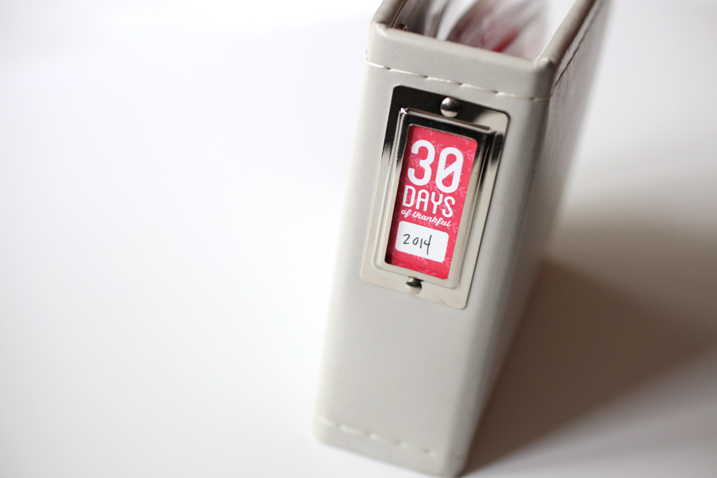 The idea is simple: document your gratitude for 30 days. Yes, it fits nicely into the month of November, but honestly? You can do this project any time of the year. This past year, I fell deeply and madly in love with the We R Memory Keepers 4 x 4 binders and I knew I wanted to make the mini-est of mini albums for this year’s 30 Days of Thankful volume. Seriously? Those 2 x 2 pockets? Get OUT cuteness! And guess what they are perfect for, besides adorable tiny cards? Instagrams! 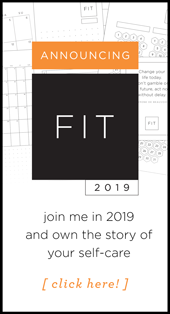 This year, I have both digital products (PDF printables plus files that you can fully customize to change the color scheme yourself) and some actual physical products from Studio Calico. This is really exciting for me because I get to see my very first stamp sets come to fruition. This set includes everything you need to create your own 4 x 4 inch mini-album, minus of course the card stock and the actual album and page protectors. It includes a 6 x 4 multi-photo template to let you create your own sheet of 2 x 2 images for those mini pockets. It also includes a PDF Guide to the project which I’m going to share with you today to give you a better idea of what it’s about as well as to share links to products you can use to complete the project. I also designed a corresponding digital stamp and brush set, including many of the design elements of the album package. You can use these to create your own card designs or drop them onto photos. And speaking of Project Life, I also designed a simple set of 3 x 4 cards . Use these cards in the basic Design A page protectors, or use the Design F page to and cover several days of gratitude in a single page. This set includes a full sheet of printable journal cards that you can use to document your gratitude and also comes with fully layered PSDs to allow complete color customization. I realize not everyone wants to do pink and yellow but you have to admit, kind of adorbs, right? All three digital products are on sale for 20% off through Midnight Tuesday at Designer Digitals. And last but not least, there are three products available at Studio Calico. First up, this set of 4 x 4 inch cards to build this album (available for individual purchase later this week!). 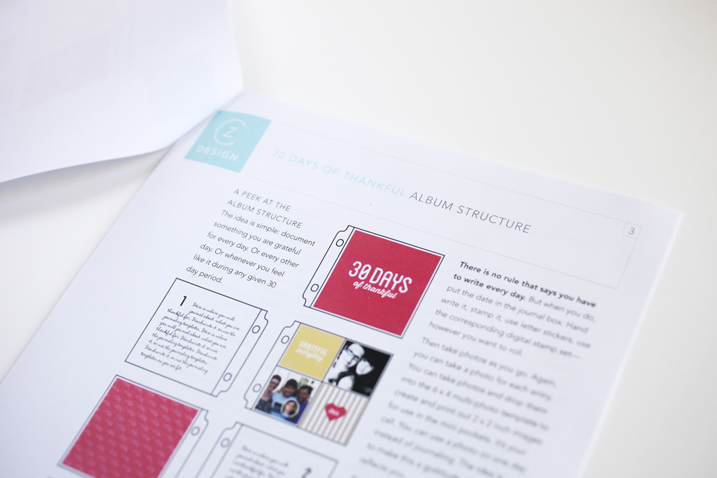 The purchase includes a digital PDF download to print as many journal cards as you need. Next, a 30 Days of Thankful stamp set. plus a single 1.5 x 2.5 logo stamp. Here’s a clearer view of the 4 x 6 set of stamps. The stamps coordinate with the album kit. 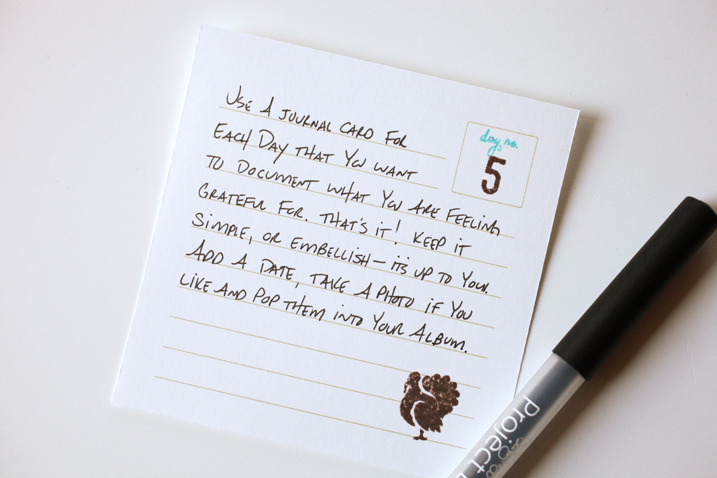 You can use the number stamps to add dates to the 4 x 4 journal cards, or simply design your own gratitude cards. PRODUCT AVAILABILITY: The special bundle has sold out. Please check back as I will be updating this post as the products become available for individual purchase. I love this project as it really tends to center me before the joyful chaos of December. 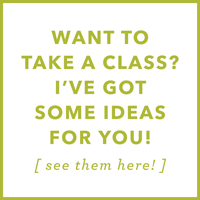 I’d love to have you join in, either with my designs and products, or just create your own. If you have any questions, don’t hesitate to email me. JOIN IN ON FACEBOOK: Last but not least, I’ve created a Private Facebook Group for anyone interested in joining in. Click here and request to be approved. (I’ll approve you within 24 hours, but likely much sooner!) Only group members can see what is shared in the group. You do not need to be using my products to participate. The group is open to everyone who wants to document gratitude in November with me. I will be posting and sharing there beginning in November, but you’re welcome to join in any time if you have more specific questions, etc. MORE EXAMPLES FROM YEAR’S PAST: I’ve done a variation of this project for the past five years. Any of the formats work with this concept. Woot woot! Can’t wait for the bundle to be available. I did this with Cathy’s 6×6 album design the last two years but I have a 4×4 WRMK album just waiting to be used for this mini, mini 30 Days of Thankful! Thanks Cathy! 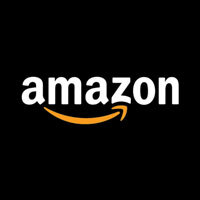 Just ordered the digital pkg. I LOVE this project and I have a 4×4 WRMK album just waiting to be used! I love this project every year! I am excited for the new products, too. This is such a fun and meaningful album. Thank you! Yay! Always look forward to this project. It’s one of my favorites, I just wish I could remember to incorporate the idea into my PL every month versus just November!! Love all the stamps, too! Great job and so much fun! Cathy I love this so much. I still have the kit I bought last year to do this and never did, if I use that can I still join the FB group?? Oh my! So many options. Awesome color palette. Love all of the flexibility you have built in for us. And…congrats on birthing your first bouncing baby stamps! Thanks, Yolanda. Labor didn’t hurt at all! I’m in! Just ordered my album & extra page protectors. Anyone else mentally ticking off the things they’re thankful for?? Such a great life – excited to document it. Thank you for the motivation, Cathy! Oh my stars! This is so awesome! I love the colors and the sizes. Count me in! Another amazing album by CZ! Congratulations on your first (physical) stamp set! Obviously your design skillz are a perfect match for that type of product. I love the little turkeys — cooked and uncooked. lol Happy Monday! This post came at a perfect time Cathy. Here is an entry on my task list for Wednesday that I scheduled a long time ago, “30 Days of Thankful this year? How?” Your post gives me a lot to think about with the possibilities. I look forward to making a choice/mapping out a plan this week. I love the colors this year. Awesome! Love everything. Can’t wait to get it. This project is one of my favorites. Just out of curiosity – would there be 31 day cards/elements for your Canadian friends 🙂 ? Very excited to make this album. Love the stamp set & the digital products. Oh man!!! I really want these Cathy….but I won’t order from Studio Calico….they are truly something I am not thankful for! Terrible customer service and product quality. You did a great job on your designs though – so cute! OMG… I am so excited!! I bought the gold mini album months ago with no idea what I was going to use it for, now I know!! Thank you for putting together so much cuteness! I love it! One question tho… how did you make the label for the spine of the album? How did you know I have an empty WRMK mini album & inserts waiting to be filled up?! 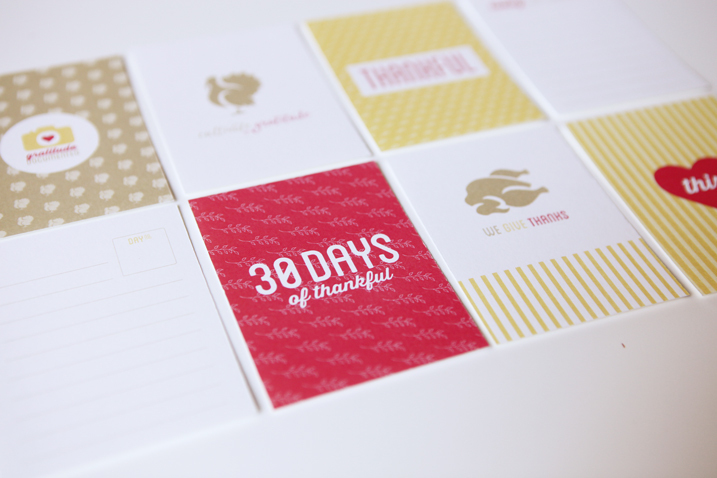 LOVE the colors & design of 30 Days of Thankful. Clean, fresh, & fun! I’m in the other side of the world, which takes 10-15days for a package to arrive. If i order your stamp from SC — not sure it would arrive before Nov 1. Hmm.. what should I do? This looks great! I’m so excited! This is my 2nd favorite thing you do each year, and I always look forward to it. What’s my number one favorite thing you do? The bee costume/dance on Halloween, of course! 🙂 Just a few more weeks! I agree! The Bee Costume and Dance is my favorite thing every year, too!! I love this project! I do a Daily Gratitude on my FB page for November every year and have been thinking about making an album for them. 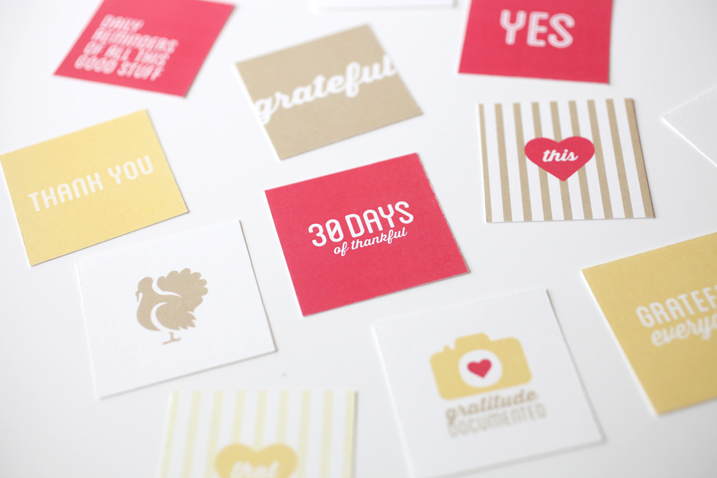 I can totally see using your products to make it…especially that stamp set! I love that you have a stamp set and PLEASE tell us that you have more in the works! Thanks, Helen! Yes, I will be having some things going forward in the stamp realm! Cathy, I sure wish I would have not been so anxious to order the digital package from Designerdigitals.com over the weekend. That didn’t include the stamp set. Bummer. Will the stamp set be available for purchase by itself? If so, from Studio Calico or from your own website? Yep – I bought all of them so maybe I don’t actually need the physical acrylic stamps. It’s just that they are so cute – and considering this is your Debut stamp set, I guess I thought I needed them. 🙂 Sometimes I like to use things like real cardstock and ink instead of doing everything in Photoshop and I just didn’t think of that when I saw the cute stamps. Thanks for your answer! 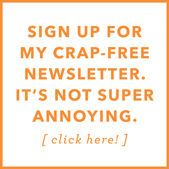 (And your creativity) Love these 30 Days products! Hey Cathy, I love the colors, great job! I was thinking I might skip 30 days of Thankful this year so that I can finish last year’s project, lol! How fabulous that you now have a physical stamp set too! Do you have plans for more physical stamp sets in the future? I just pre-ordered the kit. Looking forward to playing along. I think I ordered the kit twice. lol. I love all of this Cathy!! Awesome job on it and I LOVE that stamp set!! How cute that mini album is. Thanks for letting us join in the fun with you. I’m not sure what I will be doing yet but documenting November and being thankful are my two favorite things ever. Hello Cathy, I’m going to apologize now if you’ve already answered this and I’ve just overlooked your response. I’ve just ordered the bundle kit from Studio Calico, but am curious to know if I also need to purchase the digital supplies as well. Hey Cindy, no! You do no need the digital set. 🙂 The bundle from Studio Calico comes with one digital file of four blank journal cards. You can print as many cards as you need for the project. Then you can use the stamps to date them and embellish them, plus the other decorative cards in the set! Sound good? I purchased the digital files as well, just to be on the safe side and to have more options! This is FABULOUS!!!! Love the concept; love the colored cards!!! This will be my first 4 x 4 album! Thanks Cathy…you’re creativity is AMAZING!!!!!!!!! I just pre-order my kit from studio calico. So excited to do my first 30 Days of Thankful album!! I am pretty sure that I will not get those in time, since I live in Brazil, but I will, for sure, “pre build” my album as I wait for the kit! And I LOVE this!!! Just saying!!! Have been waiting for this. Love this project 🙂 I am starting today. It gets busy here in Australia as the school year ends for us in Dec and Nov/Dec gets crazy with end of year concerts, presentations, parties etc. I need end of Dec to get my Dec Daily ready! So off to start with Day 1 woohoo!! Can’t afford any newly bought product right now (sorry), so I’ll be using my stash for this instead. love this!!! i have pre-ordered mine. You can write, design, and run a business. You’re a triple threat! I love your ideas and find them inspiring. Laurie, thanks for saying that. I appreciate it. Just ordered my little album for this darling project! What is the price for the bundle? It doesn’t come up on SC site. Judy, it’s $19.99. I think you have to be logged in to see it. 🙂 They are planning to offer individual purchases later in the week, I have been told. Love this concept! I think I will try it this way for my first Grateful mini! I am debating getting the SC kit…because I LOVE the stamps! I saw you said the stamps will be offered separately later in the week..do you know how much it will be? And are the stamps acrylic or photopolymer? I know you said acrylic in your post but I just want to double check. Not sure just yet! I’ll be keeping people updated on my Facebook page for sure! 🙂 They are acrylic, I believe, but let me double check! Sold out….so may have to do digital……ugh. 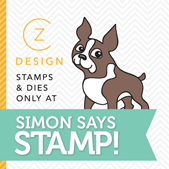 Thanks for diving into stamps and love the 4×4 idea. Since I have trouble with the color when printing (I am the baby pink girl!! ), I think I will take the idea and run with it! Maybe they will restock the stamps?? They will be selling more stamps, I believe. 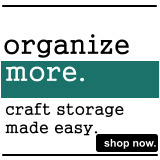 Plus, pink girl, don’t forget about office supply stores! They can print PDFs for you. 🙂 Just a thought! I just finished last year’s album about a month ago! This year’s goal is to get those pictures printed more timely. The kids really loved helping to create/journal and are looking forward to the project again this year. Congrats on your stamp set ! Thea, I don’t believe they are restocking the kit bundle, though you can buy the stamp sets themselves. The digital package contains printable PDF cards. You only need the free program Adobe Acrobat to print them out. In our private Facebook group, I just posted a video (it’s viewable by everyone, actually) and it walks you through the sets. Yes, the two states of the turkey are making me chuckle this morning. I’m not sure li’l Tom feels like giving thanks after he’s cultivated, but I do! Fine. I’m sold. Tell me what to do master. Easy now, little one. First, make sure you have Photoshop. Then, we talk. I love last year’s sets too! 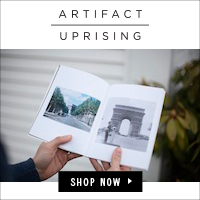 My book I made with Artifact Uprising is one of my fave! What is the difference between the basic digital package and the Studio Calico 4 X 4 inch cards (which isn’t currently available)? Thanks. I must be losing it … there is a line above that says you can download the PDF guide for the structure of the album, but no link. Whoooops! Let me update it. SORRY! Hey Thea, this is not technically a class. 🙂 It just starts on Nov. 1. 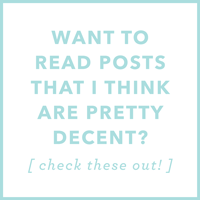 I have another post about the project today on my blog!